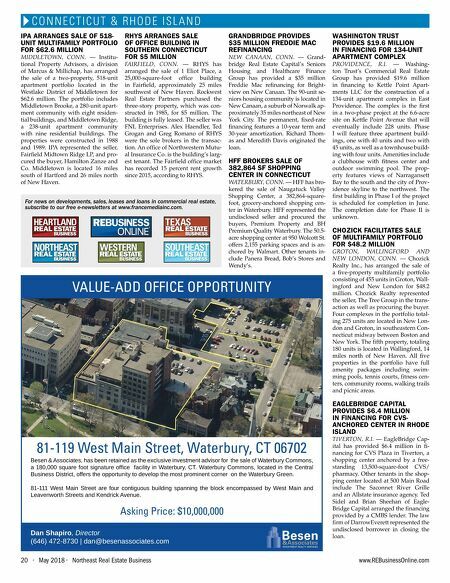 20 • May 2018 • Northeast Real Estate Business www.REBusinessOnline.com C O N N E C T I C U T & R H O D E I S L A N D 81-119 West Main Street, Waterbury, CT 06702 Besen & Associates, has been retained as the exclusive investment advisor for the sale of Waterbury Commons, a 180,000 square foot signature office facility in Waterbury, CT. Waterbury Commons, located in the Central Business District, offers the opportunity to develop the most prominent corner on the Waterbury Green. 81-111 West Main Street are four contiguous building spanning the block encompassed by West Main and Leavenworth Streets and Kendrick Avenue. Asking Price: $10,000,000 VALUE-ADD OFFICE OPPORTUNITY Dan Shapiro, Director (646) 472-8730 | dan@besenassociates.com IPA ARRANGES SALE OF 518- UNIT MULTIFAMILY PORTFOLIO FOR $62.6 MILLION MIDDLETOWN, CONN. — Institu- tional Property Advisors, a division of Marcus & Millichap, has arranged the sale of a two-property, 518-unit apartment portfolio located in the Westlake District of Middletown for $62.6 million. The portfolio includes Middletown Brooke, a 280-unit apart- ment community with eight residen- tial buildings, and Middletown Ridge, a 238-unit apartment community with nine residential buildings. The properties were constructed in 1988 and 1989. IPA represented the seller, Fairfield Midtown Ridge LP, and pro- cured the buyer, Hamilton Zanze and Co. Middletown is located 16 miles south of Hartford and 26 miles north of New Haven. RHYS ARRANGES SALE OF OFFICE BUILDING IN SOUTHERN CONNECTICUT FOR $5 MILLION FAIRFIELD, CONN. — RHYS has arranged the sale of 1 Eliot Place, a 25,000-square-foot office building in Fairfield, approximately 25 miles southwest of New Haven. Rockwest Real Estate Partners purchased the three-story property, which was con- structed in 1985, for $5 million. The building is fully leased. The seller was FNL Enterprises. Alex Haendler, Ted Grogan and Greg Romano of RHYS were the sole brokers in the transac- tion. An office of Northwestern Mutu- al Insurance Co. is the building's larg- est tenant. The Fairfield office market has recorded 15 percent rent growth since 2015, according to RHYS. GRANDBRIDGE PROVIDES $35 MILLION FREDDIE MAC REFINANCING NEW CANAAN, CONN. — Grand- bridge Real Estate Capital's Seniors Housing and Healthcare Finance Group has provided a $35 million Freddie Mac refinancing for Bright- view on New Canaan. The 90-unit se- niors housing community is located in New Canaan, a suburb of Norwalk ap- proximately 35 miles northeast of New York City. The permanent, fixed-rate financing features a 10-year term and 30-year amortization. Richard Thom- as and Meredith Davis originated the loan. HFF BROKERS SALE OF 382,864 SF SHOPPING CENTER IN CONNECTICUT WATERBURY, CONN. — HFF has bro- kered the sale of Naugatuck Valley Shopping Center, a 382,864-square- foot, grocery-anchored shopping cen- ter in Waterbury. HFF represented the undisclosed seller and procured the buyers, Premium Property and BH Premium Quality Waterbury. The 50.5- acre shopping center at 950 Wolcott St. offers 2,155 parking spaces and is an- chored by Walmart. Other tenants in- clude Panera Bread, Bob's Stores and Wendy's. WASHINGTON TRUST PROVIDES $19.6 MILLION IN FINANCING FOR 134-UNIT APARTMENT COMPLEX PROVIDENCE, R.I. — Washing- ton Trust's Commercial Real Estate Group has provided $19.6 million in financing to Kettle Point Apart- ments LLC for the construction of a 134-unit apartment complex in East Providence. The complex is the first in a two-phase project at the 6.6-acre site on Kettle Point Avenue that will eventually include 228 units. Phase I will feature three apartment build- ings, one with 40 units and two with 45 units, as well as a townhouse build- ing with four units. Amenities include a clubhouse with fitness center and outdoor swimming pool. The prop- erty features views of Narragansett Bay to the south and the city of Prov- idence skyline to the northwest. The first building in Phase I of the project is scheduled for completion in June. The completion date for Phase II is unknown. CHOZICK FACILITATES SALE OF MULTIFAMILY PORTFOLIO FOR $48.2 MILLION GROTON, WALLINGFORD AND NEW LONDON, CONN. — Chozick Realty Inc., has arranged the sale of a five-property multifamily portfolio consisting of 455 units in Groton, Wall- ingford and New London for $48.2 million. Chozick Realty represented the seller, The Tree Group in the trans- action as well as procuring the buyer. Four complexes in the portfolio total- ing 275 units are located in New Lon- don and Groton, in southeastern Con- necticut midway between Boston and New York. The fifth property, totaling 180 units is located in Wallingford, 14 miles north of New Haven. All five properties in the portfolio have full amenity packages including swim- ming pools, tennis courts, fitness cen- ters, community rooms, walking trails and picnic areas. EAGLEBRIDGE CAPITAL PROVIDES $6.4 MILLION IN FINANCING FOR CVS- ANCHORED CENTER IN RHODE ISLAND TIVERTON, R.I. — EagleBridge Cap- ital has provided $6.4 million in fi- nancing for CVS Plaza in Tiverton, a shopping center anchored by a free- standing 13,500-square-foot CVS/ pharmacy. Other tenants in the shop- ping center located at 500 Main Road include The Saconnet River Grille and an Allstate insurance agency. Ted Sidel and Brian Sheehan of Eagle- Bridge Capital arranged the financing provided by a CMBS lender. The law firm of DarrowEverett represented the undisclosed borrower in closing the loan. 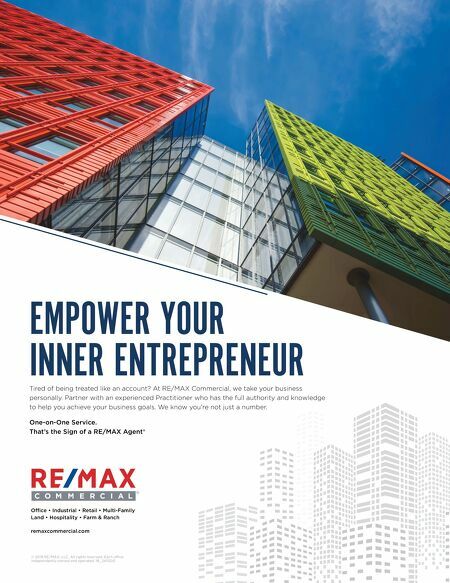 For news on developments, sales, leases and loans in commercial real estate, subscribe to our free e-newsletters at www.francemediainc.com.